We’re finally replacing the windows in the kitchen so that all the windows in the house will be triple-pane. With the installer banging on the side of my house right now, it seems like a good time to post my pictures and news from my recent trip to New York for the Audio Publishers Association conference and BookExpo. The Doubletree Guest Suites Time Square is my favorite hotel in New York. 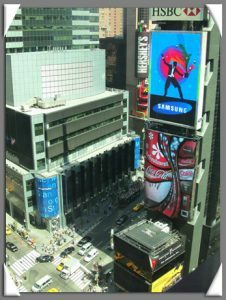 I was pleased to get a BookExpo rate and thrilled with my incredible view of Times Square from the 16th floor. 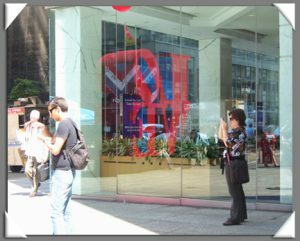 On my free day in the Big Apple (Wed., 30 May), I walked around and boosted the local economy as much as possible. Since Drew was unable to make the trip with me, I bought some presents for him. 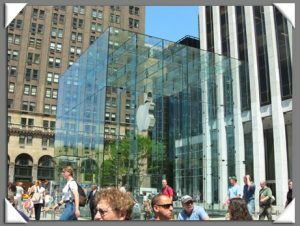 I first stopped at the Apple Store on Fifth Avenue. I bought a Remote Radio for Drew to use with his iPod. He is delighted that he now can listen to FM radio while riding his motorcycle. I’m sure that Apple Store will be packed tomorrow with the first sale date of the iPhone. I’m going to get one….but not tomorrow! Love was in the air in New York, but it was also on the ground. Somewhere on my walk, I came upon a sculpture of the Love logo associated with the 1970 film Love Story. In a web search, I learned that the sculpture was created by Robert Indiana and located on the corner of 6th Avenue and 55th Street in Manhattan. Just like I give a different read when voicing scripts, I look for the unusual shot when taking pictures. The Audio Publishers Association conference was held at the Jacob Javits Convention Center on Thursday, 31 May. I like to attend sessions aimed at both audiobook publishers and their narrators, especially since I am planning to start my own audiobook production company. 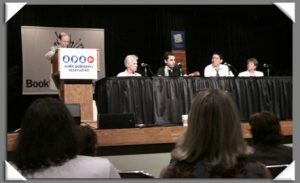 This year, I went to the sessions on alternatives to CDs, technology and a narrators’ panel. I appreciated hearing from Audio Publishers Association, a literary agent at Inkwell Management. Alexis said it has become increasingly important for agents to retain the rights due to the proliferation of digital downloads. She also said it “makes sense” for authors to have sound bites prepared for podcasts, YouTube, etc. (If any authors or publishers need professional voice talent to assist with these types of endeavors, call me!) Alexis was also kind to speak with me personally following the session and answer some questions about the rights process. If you’re wondering whether digital downloads have killed the interest in CDs, know that books on CD are still viable. Theresa Thompson is a buyer for Barnes & Noble, who stated that her audiobook business in the stores is still strong. Her expectation is turn inventory, so she doesn’t want to create proprietary titles. The technology panel was extremely interesting and informative. Where the iPod connector is proprietary to Apple, David McLaughlin at Microsoft told us that his group is working to define a standard, universal connector that would connect a variety of devices, including MP3 players, to cars. Some of the discussion also centered around getting younger people interested in audiobooks. Dave Carnoy, an executive editor at C/Net and all-around gadget guy, said he thinks that the market for audiobooks is with an older crowd. He commented that young people don’t read any more and wouldn’t listen to a book. Carnoy said that the price of audiobooks seemed too high to him. He pointed out that the consumer thinks someone is just reading the thing and that audiobook creation wouldn’t be difficult or costly, especially since so many people create podcasts. Carnoy said that an audiobook is potentially a single-use application, where music is used many times. After networking with publishers at lunch, I exchanged a few words and a hug with my friend, narrator Barbara Rosenblat. I somehow missed connecting with my friend and teacher Hillary Huber at both APAC and at BookExpo. My friend and teacher Alan Sklar was signing audiobooks at BookExpo, but I didn’t get to see him, either. Sue Mackewich, Executive Producer, Audio Publishers Association. The casting process varied with each person. Ruben does read reviews and remembers them when casting audiobooks. Bronstein said he typically contacts talent agents or has a relationship with narrators. He emphasized that he wants someone who can take direction. Kao said it’s helpful to know the producers and mentioned that opportunities exist to perform wrap-arounds (intro/outro), podcasts and in digital downloads. Bronstein said self-help/self-development titles continue to be strong. His best sellers are fiction, self-help and business. Conger noted that publishers are reading you when you shake their hand. He also stressed that narrators often go too fast in the performance. Allow yourself to be surprised by the words. Ruben echoed the point about speed, saying that you miss the interpretation by going too fast. Mackewich reminded the audience that people who aren’t even born yet will listen to the recording. While Bronstein has never worked with a talent from the talent’s home studio, Kao said he might employ a talent with a home studio. Conger said he wouldn’t do a book longer than 3 hours from his studio. However, narrator Simon Vance was in the audience and stated that he had performed long books from his home studio. Conger said that the narrator is not the star in non-fiction; the material is the star. Ruben added that you need to be emotionally connected to the author’s point of view in non-fiction as the author is the enthusiastic star. Narrator and audience member Richard Ferrone commented that the narrator is still the storyteller in non-fiction. Finally, Ruben said that if a narrator is reading to him, the narrator is emotionally disconnected to the work. Mackewich suggested that narrators gently follow up in order to approach her. She said you could send postcards and e-mails about your work, as well as get an audiobook agent in New York. 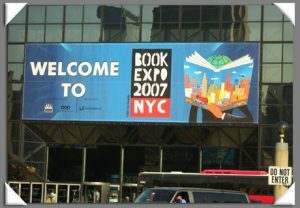 I only had the one day at BookExpo due to a somewhat inflexible airline schedule on a Skymiles ticket. Audio publishers exhibited at BookExpo, but I also talked to targeted print publishers about creating audiobooks, commercials and podcasts for them. I researched my prospects as much as possible ahead of time so that I could go straight to the booths I wanted to visit. I left both APAC and BookExpo with a stack of contacts and great potential to work with a number of new clients. I have mailed postcards and notecards as follow-ups, and I’m already looking forward to both events next year in Los Angeles! 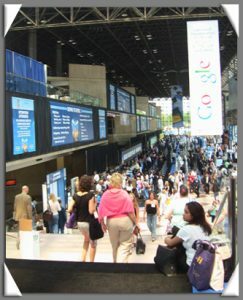 I was unable to attend BookExpo last year and was delighted to discover that many of the educational sessions were recorded and provided to listeners as podcasts. Through listening to those podcasts, I learned valuable information that I could apply in my voice-over business. Podcasts from this year’s BookExpo are now available. Now that I’ve given you a look at my trip to New York, I think I’ll go take a look at my new kitchen windows. Great summary Karen – sorry I was unable to attend this year but it followed too closely on the heels of the audiobook master class I took with Pat Fraley and Hillary Huber in New York at the beginning of May. Perhaps we can plan to get together next year in LA! I did however recently attend BookExpo Canada where I met a number of authors and publishers that I too will be following up with. Hope the windows turned out great and that you can soon get back to work. Thanks for the terrific report. And I hope you received my reply to your email the other day.